A few years ago, I took a long-haul flight to London. Since I knew the flight was 11 hours, I knew I needed to buy some kind of travel pillow to keep my head from falling forward as I slept, waking me up and straining my neck. A trip to Target ended with the purchase of a soft, turquoise, inflatable pillow. I wanted one that could fold away, so an inflatable pillow seemed perfect. However, an hour into my nap, I suddenly realized that the pillow began to deflate. A few embarrassing attempts to blow it up again, and I knew it had a slow leak somewhere. I accepted defeat and knew I wouldn’t be sleeping much on that flight. Since then, I’ve gone out of my way to test as many travel pillows as I can lay my hands on. Partly to prove a comfortable travel pillow exists and partly because I’m annoyed I wasted money on a bad one. And in my favorite store of all places. Will I be sleeping upright or can I lean on the window? Is it for me or my kids? Can it be minimized when not in use? Is it discrete or is it eye-catching? Do I need orthopedic support? How much does it cost and how often will I use it? Keeping that in mind, here are the best travel pillows for upright and window sleepers, orthopedic needs, unique designs, and for kids. Will you be sitting away from the window? 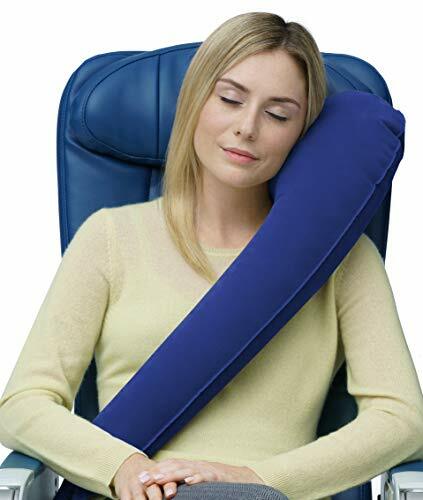 If so, this neck pillow from Turtl will keep your head from landing onto the passenger beside you or strain your neck, when your head starts leaning over. Technically, you don’t need to read further than this travel pillow recommendation. Frankly, it’s the best of the bunch. If you’re in a rush to select a travel pillow, get this. According to the manufacturer, this neck support pillow is scientifically proven to give ergonomic support to your neck during a long flight. Considering mechanical engineers and physiotherapists developed the design, I definitely agree with their claim. I found that my head was comfortably cradled for the entire time that I napped, which in this case was 5 hours on my flight. The pillow is half the size of the average travel pillow, so takes up hardly any space in my purse. It can also attach to luggage for convenience. The Turtl comes in four colors – grey, black, coral and red. I went with coral as I didn’t want my makeup to show on the darker fabrics if it rubbed off. It doesn’t matter too much though, because the fabric is also machine washable. Despite its snazzy design background, it doesn’t break the bank. Although I will give my money to anyone that makes my life easier, I’m always on the hunt for a good deal. Using it is easy, you just hold one end near your cheek, and then wrap around your neck like a scarf. It’s really that easy. There’s even a video online if you’re still confused. 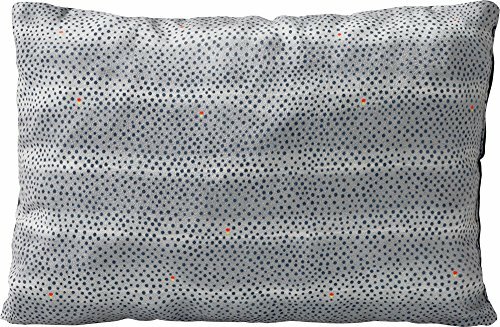 PREMIUM MEMORY FOAM: Made with plush, high quality memory foam, the Evolution Pillow is responsive to your adjustments and offers you the head, neck, and chin support you need to travel and rest better. 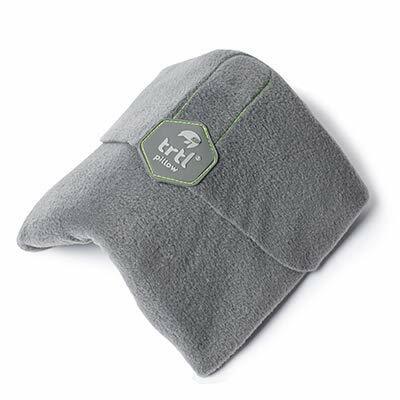 WASHABLE COVER: Made out of high quality soft velour, the Cabeau Evolution Memory Foam Travel Neck Pillow includes a removable and washable cover that makes cleaning a breeze and eliminating germs easy. It's like taking a new pillow with you on every trip. TRAVEL BAG: The Evolution Pillow Travel Neck Pillow was built for convenience and portability. It comes with a small travel bag that allows the neck pillow to compress down to ½ its size so you can relax on airplane trips. 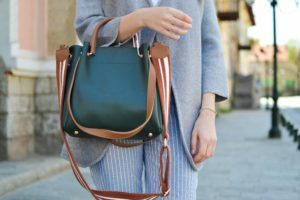 You can even use the bag's outside straps to attach to your luggage to save space. MONEY BACK GUARANTEE: Cabeau is committed to your complete satisfaction. Accordingly, we will replace all damaged or defective products due to materials or workmanship, upon your receipt of product. So get your must-have airline accessory and travel companion. 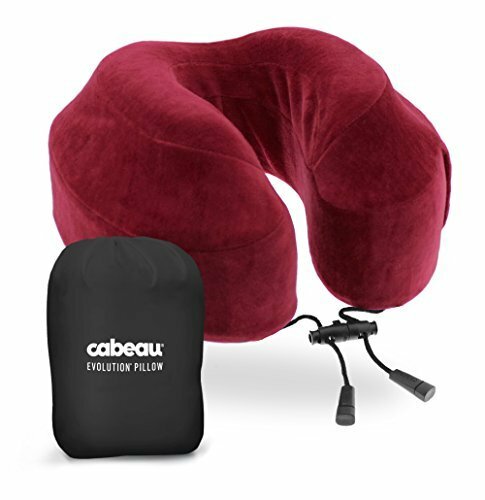 Another great choice when you’re sleeping upright, is the Cabeau neck pillow. It gives you comfortable support courtesy of the memory foam filling. Memory foam has the ability to remain firm, yet mold to the contours of your body. Whether your head leans to the left, right, or forward, this airplane pillow is designed to cradle your entire neck. It is taller than most travel pillows, which is ideal when you’re sleeping upright in a car, train, or plane. When the back of a neck pillow is too thick, it can push your head forward, putting your neck into an uncomfortable position. Not so, with this neck pillow. The pillow’s back is thinner than most travel pillows, which allows your head to remain upright, in the most natural position. To maintain the soft velour fabric, it can be removed and washed when needed. It also comes with a small travel bag, which helps to compresses the neck pillow into 1/4 of its original size. It’s really handy when you aren’t using the neck pillow. SUPER CONTOUR COMFORT - You know what they say: a good day's work starts with a good night's sleep! Following the natural contours of your body, Lights Out travel pillow gently supports your neck, offering a custom-fit feeling that just can't be matched. BLOCK OUT THE WORLD - Too much light, noise or even germs around you? No problem! Just pull down the hoodie of your Lights Out pillow to block the light and germs around you, then put your headphones on and relax in the sound of your music. BLOCK OUT GERMS - Lights Out Is the world's first travel pillow with "Germ Shield" technology which allows you to easily create your own safe environment. Simply pull down the hood on your Lights Out and let the Germ Shield Carbon filter give you maximum protection. 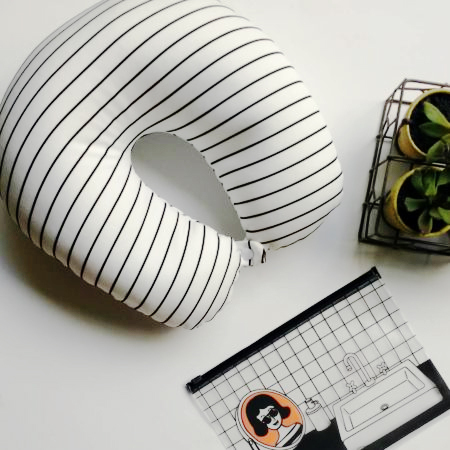 LIGHT AND PRACTICAL - If you like to travel light without sacrificing your personal comfort, you'll simply fall in love with Lights Out neck pillow. Lightweight, yet incredibly soft and comfortable, our traveling pillow is the ultimate choice of the smart traveler. FLEXIBLE AND VERSATILE - We know that every person is different, so we designed Lights Out portable pillow with two adjustable drawstrings that can be pulled to create the perfect fit. 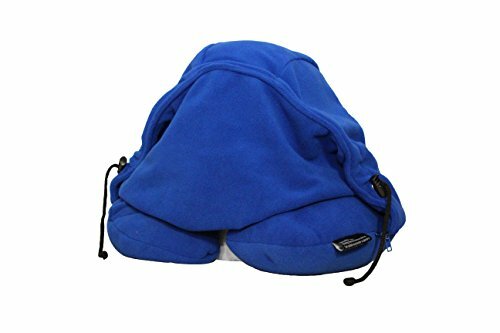 To make things even easier, the hood can be zipped off and washed whenever necessary. Sometimes you want a little sense of privacy in a cramped plane, especially when it’s time to sleep. I’m not the most graceful sleeper, especially when I’m sitting upright. Luckily, the designers over at Lights Out have come up with a simple solution to this common problem – a neck pillow with a built-in hoodie. The built-in hoodie is soft polar fleece and big enough to pull past your head. There’s nothing worse than a hoodie that is too short. Once I pulled the hoodie over, my peripheral vision was blocked and I could drift away without worrying my seat passengers were looking at my drooling face. After a few flights, I detached the hoodie and put it in the washing machine. It washed well and I was able to spruce it up after a few journeys. Inside it’s filled with microbead material, so it will mold to your neck and head shape. I found it less supportive than the previous pillow, but I need very firm support. The travel neck pillow comes in 6 colors, so you can find something that suits you. I would recommend sticking to the darker colors, to really block out the light. Sitting in a window seat on a flight can have its advantages, one being that you can lean your entire body against the window area, when getting some shut-eye. However, it’s not that comfortable, especially with the flimsy complimentary pillow the airline gives you. Some passengers go as far as bringing their pillow from home, but I find it way too bulky to drag around with me. That’s why I love these little pillows. Picking the right size is up to you, as they come in 4 handy sizes. Personally, I went with the medium size. It’s a similar size to the flimsy airplane pillow you get on a flight, but it’s more padded and is comfortable to sleep on. 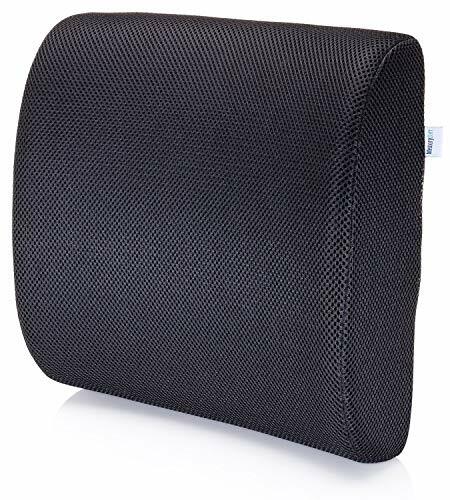 The travel neck pillow is filled with soft, urethane foam, and it can be compressed to 1/5 its size when rolled into its case, with the drawstring pulled. It was nice unrolling it and watching it expand to its final size and then folding it away when my flight was over. Use it for travel by plane, train or automobile -- Rolls Right into it's own travel case! MyPillow Promotions Not Valid Through Amazon. In 16 different colors and patterns, the My Pillow Roll and Go, is an American made travel pillow. 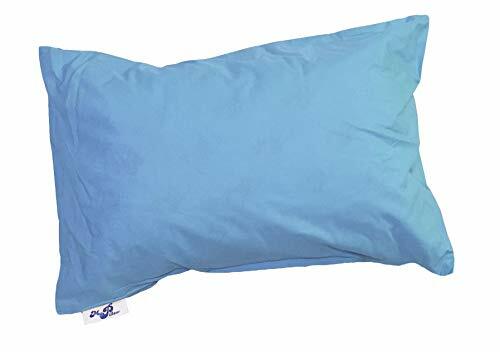 Similar to the previous Therm-a-Rest pillow, this pillow can be rolled and compressed when not in use. The foam insert and the pillow cover can both be washed. It measures 12 x 18 inches, so is similar to the small Therm-a-Rest pillow. The main difference between the Therm-a-Pillow to this one, is that it comes in more colors. I know many people who love having a full range of color options, so this is great for those people. 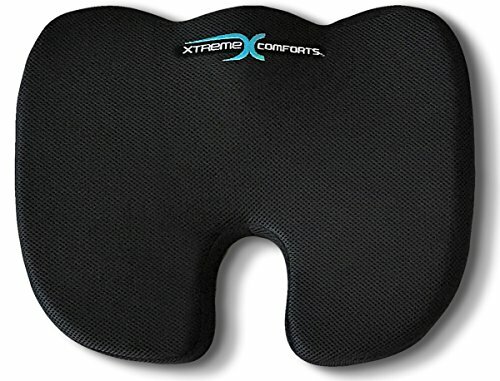 It can be used as lumbar (back) support, against a plane window seat, or when lying down. My sister has long-term issues with her coccyx. So much so, that driving, watching movies, and flying on planes especially, can be excruciating. Luckily, there are cushions designed to relieve the tailbone area known as the coccyx. Feeling self-conscious about carrying a coccyx cushion is the least of your worries, if you need to relieve the pain and discomfort you are experiencing. My sister takes this cushion to the movie theatre, without batting an eyelid. Getting high reviews from my sister and online, this coccyx cushion is comfortable to sit on for several hours. It is ergonomically designed to avoid pressure to the tailbone. The area is cut out, allowing the tailbone to receive no pressure. Inside it is filled with firm memory foam, that does not go flat after regular use. It supports the area around the tailbone and does not feel hard after extended use. You don’t need to worry about this cushion shifting around, because of the non-skid material on the bottom. The last thing you need, is to add movement to your coccyx area. SIT LONGER WITH LESS PAIN - This ergonomic memory foam lumbar pillow is made of premium grade memory foam and designed for orthopedic use, meaning you get optimal back support that molds to your back, so you can sit longer without pain! NO MIDDLE-MAN - Our direct to consumer model means we can offer better value than big corporate brands selling for $50+. Great gift idea for anyone who sits for work or at home! VERSATILE COMFORT - Great for use in the office, home, or traveling in a car, truck, bus, train, or plane. Includes an adjustable elastic snap on strap to attach to your chair, and a removable washable cover for ultimate convenience. TRY NOW RISK FREE - 30 day money-back guarantee supported by awesome small business customer service. ADD TO CART NOW, BECAUSE IT'S RISK-FREE! Please note, "MemorySoft" IS THE ONLY AUTHENTIC SELLER OF "MemorySoft" BRAND NAME PRODUCTS. Especially useful on long flights or long car journeys, the Memory Soft Lumbar Support Pillow, supports your back to provide hours of relief. When you have back problems, it’s a good idea to bring your own lumbar support pillow, rather than to hope your seat will have enough support. The lumbar pillow is ergonomically designed to fit inside the curve of your back. It doesn’t feel too big, which can contribute to even more back pain. The memory foam filling is the ideal material for custom back support. It conforms differently to each body shape and bounces back to its original shape when not in use. When sitting in a desk chair, use the elastic straps to keep the pillow in place. It can be left in place permanently, for as long as you want. A little more adventurous, the Travelrest Ultimate Inflatable Pillow, is comfortable and simple in design. It’s strangely similar to leaning on someone when sleeping, except, in this case, it’s not a boney shoulder or arm. The angle is also better for comfortable sleeping. The inflatable travel pillow can be inflated prior to boarding a plane or once you’ve boarded. It took about 7 breaths to fill it completely. I found that it was more comfortable when I filled it to 95% full. I liked the slight squishiness from inflating it a tad less. That’s my tip. When finished, it quickly deflates and rolls up and snaps to a luggage strap or handle. Another pillow with an innovative design, the J-Pillow is specially designed to cradle your head, chin, and side of your face. Multiple newspapers and magazines rave about the design and I can see why. After using this pillow, it quickly became clear how many travelers also own this pillow. I counted at least 10 passengers holding one before I boarded my flight. It’s obviously popular for a reason. If I had to describe the size, I’d say it’s similar to a basketball. It’s not especially small, but it has a handy strap that clips to your luggage. It’s certainly not as big, say, as the huge pillows some people bring from home on their flights. I was doubtful it would cradle my head, but was proven wrong. I used it in a middle seat and it still worked. I’ve read people say that it works better in a window seat, which makes sense. The pillow and cover can both be put into the washing machine for cleaning. Either tumble dry on low heat for softer support or air dry for firmer support. The manufacturer specifies which dry cycle to use for custom firmness. 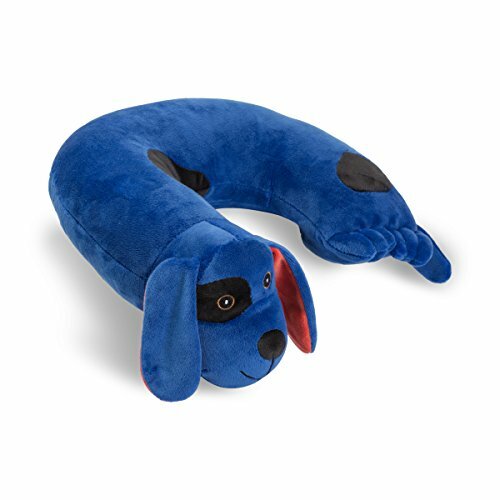 Contains (1) Critter Piller children's neck pillow in Blue Dog design. Feather-soft microfibers provide the just-right level of softness and support for your traveling child. Hypoallergenic & machine washable for the best comfort during & after your trip. Soft, cute, and cuddly. Critter Piller Neck Pillows are specially designed to cradle your child's head in just the right position to nod off. Built sturdy, this pillow will last for miles of fun. Critter Pillers are recommended for kids age 3 and up. Our feather-soft hypoallergenic fiber fill is made from recycled materials, like water bottles, for a comfortable, sustainable pillow, and the soft, cuddly, blue dog design means the Critter Piller is bound to become your child's favorite travel buddy. Critter Pillers are filled and finished in the USA. The zipper tab is removed so a child cannot open the pillow and ingest the stuffing. It provides superior support & durability for your traveling child. Make your road trip comfortable for the whole car. Built sturdy to last for miles & miles of travel comfort and fun. Environmentally friendly fill & packaging. Helping to preserve the world for the next generation of travelers. Suitable for children 3 years+. Critter Piller: Friends forever & even longer. 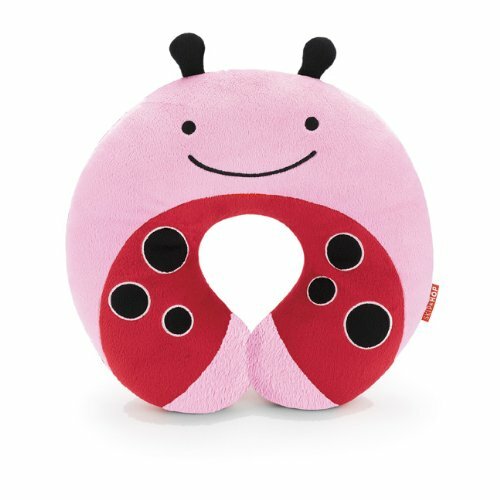 Designed for children in mind, the Critter Piller is an adorable kids travel pillow that doubles as a toy and also as a neck pillow. Feather-soft microfibers are wrapped in plush fabric, creating a lovely pillow to touch and play with. Made in America, this toddler neck pillow comes in an astounding 26 cute characters. It’s machine washable and also hypoallergenic, which I look for when buying items for my kids. I’d recommend this children’s travel pillow for kids starting at 3 years old. This is great on flights, but even better on car trips. Kids can use it around their neck or can lean on it when they sleep. No stranger to Skip Hop products, I’ve bought many of their products over the years for their fun and friendly design. Our guide to the best kids luggage features a few of their designs. The Skip Hop Zoo toddler travel pillow is another great product in their range and is great for little ones. As with all of Skip Hop’s products, they have several characters to choose from and you can purchase the matching backpacks, luggage, and water bottles, to name just a few things. I recommend this pillow for children between 2 and 4 years old. Any younger or older and they may find it uncomfortable. Soft for delicate skin, the material is velvety and feels comfortable to rest on. The neck pillow can be tossed in the washing machine to freshen up. I hope you’ve found a travel pillow that will make future traveling more comfortable. Or at the very least, made you think about what to look for when looking for the best travel pillow for you. 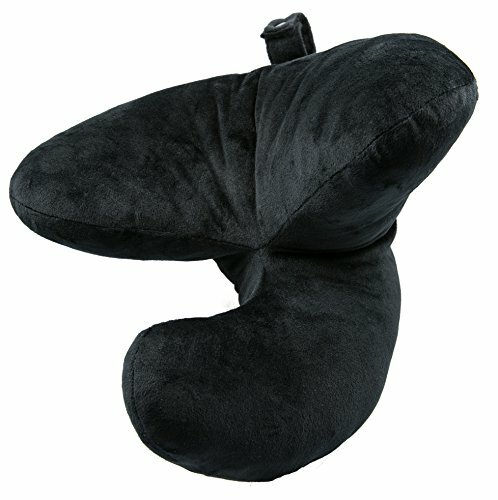 So tell me, have you also had a bad experience with a travel pillow?